In addition to a great singles draw, there’s massive IRT Pro doubles draw at the US Open; lets do a quick preview. There’s 23 teams entered, but just the top 4 qualify into the quarters, making for a very tough qualifying campaign for all but the top teams. Though by all means, these teams will have to earn it, with really quality “round of 16” matches in order. A little birdie has told me that perhaps the Moscoso/Keller team is out; this may pave the way for Jansen Allen and Nick Montalbano to make it into the quarters. In the main draw, I’m also mostly going chalk, predicting a rematch of last year’s final and the World Doubles final. That means Kane Waselenchuk and Ben Croft versus Daniel De La Rosa and Alvaro Beltran. This final resulted in one of the greatest matches in recent memory this time last year; will we get another classic? Rajsich was the big winner in Vegas, making 4 finals and winning 3 of them. One of the “big 3” WOR events of the year was this past weekend; lets wrap up the play. All the results are now in the www.proracquetballstats.com database, and i’ve interspersed links to the match report below per bracket. There were some upsets, and some expected match-ups for titles … all under the Vegas sun. Great weekends for, in particular, Montalbano (singles title, 1-wall doubles final), Rajsich (singles finalist, doubles 3-wall champ, Mixed 3-wall champ, and mixed 1-wall champ), Koll (Mixed 3-wall champ and mixed 1-wall champ), Sostre and Horn (3-wall mens finalist, 1-wall mens champ), Rolon (singles finalist, 1-wall doubles finalist), and Tisinger (Singles champ, 1-wall finalist). Next Up: the US Open! I did daily singles summaries last year and hope to be able to find the time to do that again this year. Stay tuned to a Tuesday draw preview and hopefully daily summaries starting Wednesday. Historical Note: this is the first time in history that at the end of Worlds, not one of the four champions hailed from the USA. Its also the first World title for both Guatemala and Bolivia, joining Colombia’s 2014 Men’s double triumph as the only non-North American world titles in existence. No major upsets in the 64s or 32s; the only upset by seed was #18 Andres Acuna (the Costa Rican home town favorite) ousting the Dominican Luis Perez in two games. 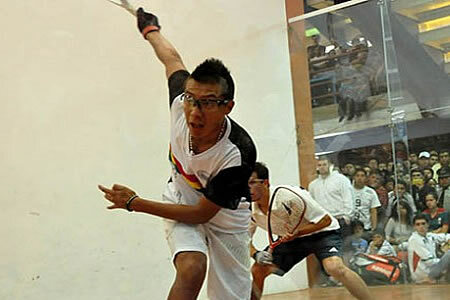 – The match of the 16s was a re-match of the game of the RRs, with Colombian Mario Mercado again outlasting Canadian Coby Iwaasa, this time by an 11-9 tiebeaker win. They went 11-10 in the group stage. Tough way for Iwaasa to exit the tourney. 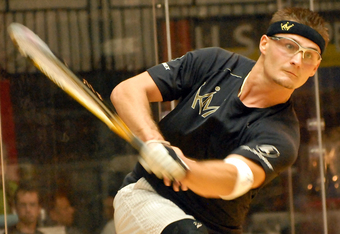 – #1 Bobby Horn survived a 15-14 first game to take out Guatemalan veteran Edwin Galicia in 2 games. 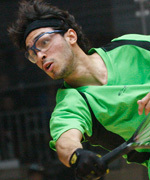 – Sebastian Franco got a very solid win and took out defending Pan American champ Bolivian Carlos Keller Vargas 14,13. A testament to the depth of this draw; Franco-Keller was a worthy semi or final, featuring two guys who both had the capability to win this draw. 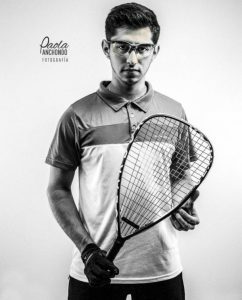 – #2 Daniel De La Rosa eased past home-town favorite Andres Acuña, who wasn’t able to pull off an upset run like he did the last time a major tourney was in Costa Rica. – The #5/#4 Rodrigo Montoya–Conrrado Moscoso Ortiz match lived up to the hype; these two guys played a finals-quality match that lasted more than 2 hours and ended up with the Mexican champion pulling away in a tiebreaker win. – #1 Horn continued his career dominance over Mercado with a 2 game win. – But the biggest upset of the Men’s draw so far was #10 seeded Franco pulling out a 11-10 win over #2 seed and tourney favorite De la Rosa. Franco has the talent to beat anyone in this draw, but De la Rosa has consistently been the better player for years on the IRT. He’ll face off against Pratt, whom he’s never beaten. In the semis, Rodrigo Montoya Solís outslugged #1 seed Bobby David Horn 9,8 in a 2 hour match that featured more than its fair share of questioned calls to advance to his first senior international final. In the other, crafty american veteran Pratt controlled his match against Franco and advanced 8,13. 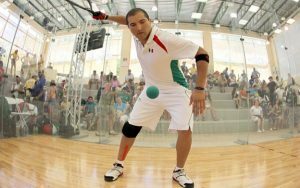 In the finals, the crowd was given fantastic racquetball, with an amazing end to game one (a 15-14 game with two potential game winning points for either player over turned on appeal) before Montoya dove his way to a 14,9 win and a World Championship. The upset of the 32s had to be Canadian veteran Jen Saunders pounding American Sheryl Lotts 10,1. Saunders had lost all three group matches and suffered an injury, but came out firing to take down the American. – two LPRT pros duked it out and a surprising result came; Argentinian Natalia Mendez controlled the match over an emotional Frederique Lambert and advanced 8,8. This is Mendez’ first win in four tries against the 2nd ranked LPRT player and a rather large upset to this observer (who thought Lambert was good for the Semis if not further). – Colombian doubles partners Adriana Riveros and Cris Amaya had a heck of a #8/#9 match, with Riveros pulling the slight upset and coming out on top 11-9. – Bolivian darkhorse Yazmine Sabja Aliss outlasted LPRT regular Chilean Carla Muñoz Montesinos in a tough breaker as well. – Maria Jose Vargas shook off her group struggles and upset 4th seeded Maria Renee Rodriguez in a tiebreaker. In the quarters, upsets abounded. – Huge upset when Guatemalan Ana Gabriel Martinez took out the #3 seeded Samantha Salas Solis 4,12. Martinez has been putting up statement wins over and over; a win over Vargas in the group stage, now this knock out win. She made the finals of the 2016 Worlds with a similar win over Salas, and will be looking to do so again. – Possibly even bigger upset when #7 seeded Argentinian Natalia Mendez wiped out American Rhonda Rajsich in game one before winning the second game 13. – Vargas continued to advance, downing Bolivian #4 seed Sabja with ease to setup a meeting with #1 Paola Longoria. This meant that the semis were comprised of the 1,20, 6 and 7 seeds. In the Semis…Longoria rebounded from a 15-6 first game loss to dominate game 2 and outlast Vargas in the tiebreker to advance. In the other semi, Martinez trounced Argentine Mendez 8,3 to continue her excellent tournament. The final was a rematch of the 2016 Worlds final, the 2017 Pan Am semis, and the 2018 Caribbean & Central American games final between Longoria and Martinez. They had played 8 times in the IRF and Paola owned all 8 wins …. 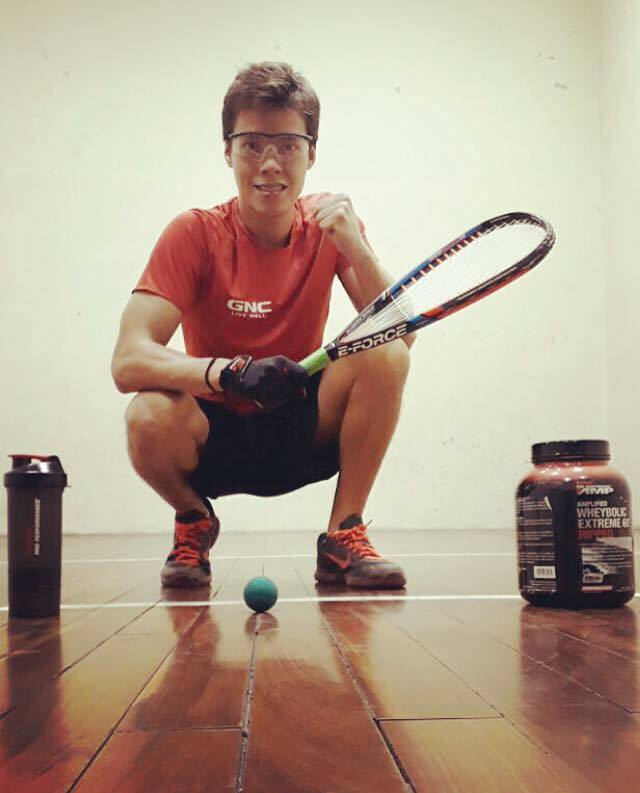 but after cruising to a first game win, Martinez fought back and shocked the racquetball world by taking the title over the world #1 (8),6,6. What’s amazing about this result is this: Martinez is still a junior! She becomes easily the youngest ever world Champion in the history of the Worlds competitions. She is playing in her age-18 season and will compete in Junior Worlds later this year to attempt to complete an unheard of double-world championship Junior and Seniors. Martinez lost the 2017 world 18U final to Montserrat Mejia as the #1 seed but should make a strong case this fall in her final junior’s event. No real upsets in the 16s. In the quarters, USA team of Sudsy Monchik and Rocky Carson got an early test, beating the talented Colombian team of IRT vets Franco and Mercado 11 and 13. The Canadian team of Samuel Murray and Tim Landeryou “upset” the #2 seeded Argentine team of Fernando Kurzbard and Shai Manzuri to move on. In the semis, the Mexican #1 team of De La Rosa and Alvaro Beltran had the much tougher match-up, going up against the talented Bolivian team of Moscoso and Roland Keller. They squeaked out the first game 14 then closed it out 14,8. On the other side, the star-studded American team rolled easily over the Canadian team 12 and 2 to setup a classic final of IRT veterans. In the final…the Mexican team seemed to play a deliberate, tactical strategy attempting to slow down the power of Monchik, and eventually they broke through, splitting the first two games then dominating the tie-breaker to take the title (10),9,2. This gives Beltran a 4th World doubles title, tying him with his long-time partner Javier Moreno for most ever Men’s World doubles titles. It also represents Beltran’s 10th international doubles title, 2nd only to Moreno. In the 16s, the veteran Ecuadorian team of Vero Sotomayor and Maria Paz Munoz upset the Canadian team of Frederique Lambert and Jen Saunders in the 8/9 match up. In the quarters, the most notable surprise was the elimination of the US team of Rhonda Rajsich and Sheryl Lotts by the Bolivian team of Yazmine Sabja Aliss and Valeria Centellas 12,10. Sabja has had great results as of late and continued her great Worlds tourney. We don’t get to see Sabja on the LPRT very often, but she’s got a ton of solid results in IRF events. In the semis, the Mexican #1 seeded team of Alexandra Herrera and Montse Mejia cruised to a win over the Colombian team of Amaya and Riveros, while in the other semi the surprising Bolivian team were perhaps already on their way to victory over the excellent Guatemalan team of Martinez/Rodriguez when an injury forfeit gave the Bolivians the win into the final. In the final, Mexico was running away with the match early; Bolivia won a tight second game 15-14 then blew away the Mexican pair in the tiebreaker to become the first world champion from outside North America. Final: (8),14,2. A quick comment on the champion Bolivian team; I did not know this until weeks after the event, but Centellas is just *16* years old. She’s still playing 16U in worlds. That’s an amazing accomplishment to see a team with a 16-yr old win a world title. Thanks for reading, congrats to all the participants, it was a fantastic event. 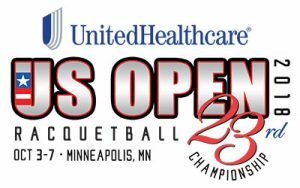 All the draws are now loaded online to www.proracquetballstats.com. Next up …we head *right* into the LPRT season, with the first ladies pro event happening next weekend in San Luis Potosi, Mexico. Maybe we’ll get another Longoria-Martinez final as i’m sure both players (and a huge chunk of the draw here) will be there.